Hordes of tourists flock to this town in Navarre, northern Spain, in early July each year for the Running of the Bulls, officially called La Fiesta del Fermin. 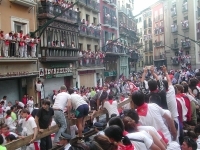 The festival, in honour of the city's patron saint, was made famous by Ernest Hemingway's novel The Sun Also Rises, and it has become one of Spain's most popular events. A bust of Hemingway stands outside Pamplona's bullring, where the 8-day extravaganza of dancing, dashing through the streets ahead of rampaging bulls, and drinking, begins. The practice of driving bulls through the centre of Pamplona started in the 19th century as the most practical way to get them to the ring, and for many years the city authorities tried to prevent the practice of running with the bulls. Aside from the festival, though, Pamplona is worth a visit any time of year, boasting lush parks, a splendid Gothic cathedral, a huge citadel and a quaint old quarter. Pamplona is the capital of the province of Navarre, but its roots are Basque and a large percentage of its population are Basque nationalists. Those joining the throng of travellers who arrive especially to run with the bulls should note that the adrenalin-pumping activity is genuinely dangerous and every year there are serious injuries.